Don’t wait! Just as infants and toddlers need experience crawling or scooting to learn to walk and babbling and crying to learn to talk, they need to practice using their hands to control art supplies and practice using their minds to figure out how art supplies work. They need the time and freedom to be curious and creative. They also need permission to freely explore other sensory activities that aren’t usually thought of as art, such as water, mud, nontoxic plant materials, and sand. Below are some art supplies that we use regularly in our classrooms—and also worked well for my toddler at home. Most of these are very easy to work with and to clean up; however, none of these will produce a recognizable product. That’s because your child is working to please the most important audience of all—himself! 1. Paint. I started painting with my daughter when she was about 6 months old after observing her interest in smearing her snacks. I allowed her to use nontoxic finger paint while she was seated in her high chair. She painted herself green and needed a bath after the adventure. As she has grown (she just turned 2), we have explored other kinds of paint, added an easel, and introduced tools. She has responded by labeling her artwork with intriguing titles like “Chopping Onions.” She also enjoys painting on objects such as rocks and pinecones. 2. Crayons, pens, pastels, and pencils. When my daughter began to show interest in using a spoon as a tool and trying to take my pens while I was writing, I gave her short and thick pens, pencils, and crayons to explore. She responded by making scribbles, then arcs, then dots, and now circles and blobs. Recently she began commenting that she is writing her name (which still looks like scribbles) and making pictures of things such as “flamingos pooping” (which look like dots). 3. Stamps and dot markers. These are fun for cause-and-effect play. Unfortunately, I introduced these tools to my daughter before she understood stamping as a concept. She decided that ripping the removable stamp pad was more fun than stamping and that trying to pick off the dot marker tips was better than dotting. This year, at 2, she seems much more inclined to use the tools more conventionally, making stamps and dots, and noticing her results. 4. Homemade and store bought Playdough and natural clay. I waited to introduce these materials, beginning at about 18 months, because I didn’t want my daughter to eat the salty homemade playdough, and I didn’t think she was strong enough to shape the natural clay. At first, she enjoyed using her fingers and tools to poke holes in the dough and clay, but she was quickly bored. Now she is more excited by various clays. She enjoys making “sunflowers” by planting pipe cleaners in her dough and also likes cutting out “cookies” with cookie cutters. 5. Sticky things. When my daughter was about 18 months, I introduced masking tape because she was trying to peel off the tape I had been using to keep her artwork on the tray. She loved it and put tape all over her picture. Since then, she has made tape sculptures (3-D art!) and moved on to stickers and dollar store Band-Aids. Now that her hand-eye coordination has improved, handling these materials is easier for her than it would have been last year. We also enjoy exploring contact paper by placing objects on the sticky side. And we have just begun investigating glue, which my daughter treats like paint. This is another good activity to do in the high chair. 6. Really gooey things. Sometimes we get into really messy activities. My daughter enjoys making mud, exploring oobleck (cornstarch and water), forming cakes out of very wet sand, “helping” with potting soil, and “cooking” bread and tortillas with us. These make a tremendous mess, so we choose days when this will be the primary activity and plan a bath right after her adventures. I find that I need to play along and join my daughter in the mud and goo, or else she notes my avoidance of the mess and won’t dive in. 7. Water and bubbles. Water play is usually a hit in the classroom and at home. When my daughter was smaller, simply splashing and making bubbles was exciting. Now she loves mixing colored water, pretending to wash dishes, playing with colored soap, exploring volume with measuring cups, and the list goes on. Soapy water (and shaving cream, too) is particularly good for play since it’s quite easy to clean up. 8. Ice/snow. This is a tricky one. Many kids don’t like getting their hands cold, so they avoid sensory activities that include touching frozen items. Offer your child a tool (such as a hammer) to chip away at the ice around a frozen object, give her mittens to keep her hands shielded when playing in the snow, or use something like salt or sand to modify ice without touching it. My daughter and I just began our frozen explorations, and mittens were key to her willingness to engage, but they also frustrated her because she likes to explore with her bare hands. 9. Various natural materials. Because we have chickens at our home and at our early childhood program, as well as plenty of wild birds, exploring the feel of chicken feed and birdseed has been an ongoing experience for my daughter. While using rice or pasta in play activities can upset families who dislike food waste, exploring birdseed before the birds eat it is culturally sensitive and nontoxic. Other satisfying natural materials include dried (nontoxic) leaves, fresh herbs such as mint, and rose petals. 10. Your toddler! As I mentioned in item one, my daughter’s first art action, like that of most of her peers, was to paint herself. Since then, she regularly colors herself. Her favorite tools for this are colored soap (bath crayons), washable marker, and paint. 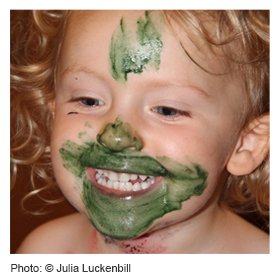 Nontoxic face paint is another option. Try to relax—the paint comes off! At the very worst, your child will be unusually blue for a day or two. Consider instead the time you spend bonding, the joy of creative expression, and the self-initiation that comes from this activity, and choose to laugh along with your toddler. As you begin this journey with your child, be aware of how you respond to your child’s efforts. You may be tempted to comment with “Good job” or to shape your child’s work by praising the art that looks most like an adult product. Try instead to comment on the process—the colors your child is using, the shapes or lines or marks created. If offered an end product, say: “You look really proud of that! You worked hard!” Research suggests that when adults give open-ended feedback instead of praise, children are more creative with their play and are more motivated to engage in activities because they want to, not because they seek our approval. I hope you have as much fun as we did as you explore open-ended art and sensory activities. We’d love to hear back what worked for you, and about any other art and sensory activities that you enjoy with your toddler.